By gluing buttons on your pumpkin for eyes, nose, and mouth, you have a simple, yet creative pumpkin. Buttons can also be used to spell out scary words across your pumpkin. Take a look at this photo where buttons spell out ‘Boo!’ Use your imagination to spell scary messages across your pumpkin. We love these pom pom pumpkin decorating ideas from BHG. For a cute and cuddly pumpkin, cover it with colorful pom poms! Simply glue pom poms all over the pumpkin – voila! Your pumpkin is turned into a cuddly creature. There are so many styles of duct tape on the market right now. In fact, decorating with duct tape is a big trend. Browse through your local craft store for a variety of duct tape styles. If you don’t want to purchase new duct tape, try using solid white tape and paste it Kris-cross all over your pumpkin in a random pattern, draw some small black eyes, or use black buttons for the eyes ; step back and admire your mummified pumpkin! These duct tape pumpkin decorating ideas are a great no pumpkin carving idea from Home Talk! What better way to make your pumpkins match your homes décor then by painting it with left over wall color? Grab that paint can from the garage ̶ you know the one that has that perfect color that you found for your kitchen or den ̶ then slather this color all over your pumpkin, allow to dry and presto – you have a pumpkin customized to your home. 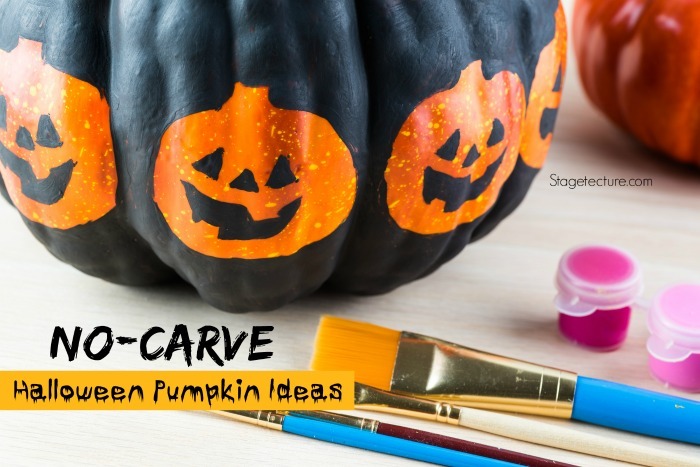 Style Caster features pretty and cute pumpkin painting ideas here. The great thing about these last minute décor ideas is that you only have to spend the few dollars on your pumpkin, the rest of the items can all be found in your very own home. Have fun searching your home for ideas to create your own creative pumpkin masterpiece. For more Halloween Ideas for your home take a look at these.